In Vietnamese New Year party, beside traditional dishes, no family can forget to make a tray of “Mứt Tết”, a cup of tea, betel and areca ready to entertain their visitors. “Mứt Tết” refers to fruits or vegetables that have been prepared and canned for long term storage. The preparation of preserved fruit traditionally involves the use of pectin as a gelling agent, although sugar or honey may be used as well. There are various types of fruit preserves made in Vietnam, and they can be made from sweet or savory ingredients. “Mứt” is made from all sorts of fruit, including mandarin oranges, apples, banana, coconuts, persimmons and breadfruit. Vegetables like patatoes, carrots and squash are also turned into “Mứt”, as certain types of blossoms. The most famous variety of “Mứt” is made from rose petals or peach blossoms. The raw materials are cleaned and peeled, then soaked in sugar and cooked until dry. Other types of “Mứt” have the sticky consistency of jam. Some varieties, like “cu lac” (peanut jam) are covered with a thick layer of sugar, but most have thin layer of sugar. 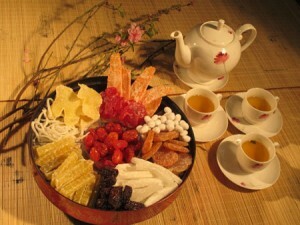 The colors are often quite intense and people serve different types of “Mứt” together, arranged in a colorful display. In Hanoi, Hang Dieu or Hang Duong Streets in Old Quarter are famous for shops that sell “Mứt”. Preserved fruits are masterpieces in these shops. They make all kinds of preserved fruit such as ginger, waxy pumpkin, apple, orange, lemon and carrot in various shapes and colours.